In our final posting on Tent Seating Guidelines, we will go over the miscellaneous measurements for events. These are those optional features that some people just need to have, and others could live without. Dance Floors depend on the amount of people and the event. Stages/ Platforms depend on the use. Pianos take up a much larger amount of space than the typical band stand. A spinet (upright) piano takes up 30 square feet. A grand piano takes up 100 square feet! We hope these measurements will be of use in planning your events. As we draw to a close on Tent Seating guidelines, we will show the seating capacity for Cathedral Seating in a tent. 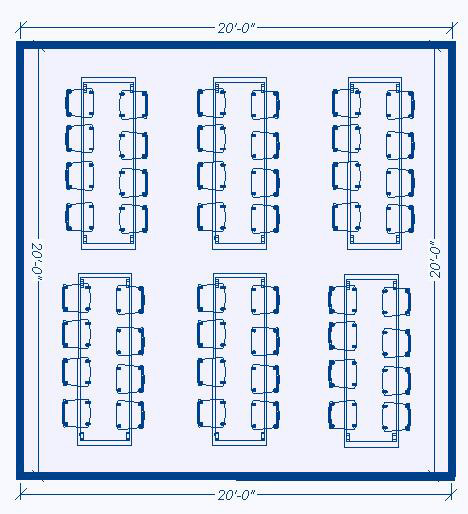 Here’s how the funky math for this turns out: for Cathedral Seating, which involves chairs in rows, you need to allow for 5-6 square feet per person, for appropriate comfort. This number factors in the size of the chair and the fact that they are in rows. 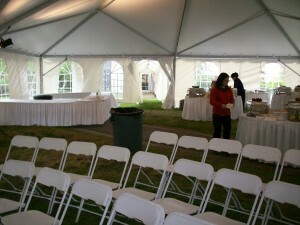 A 20 x 20 foot tent covers 400 square feet, so 400 square feet divided by 5 square feet equals 80 people. This is the recommended maximum. If you wanted to make sure people were spaced further apart and more comfortable which we strongly recommend and is shown above, divide 400 by 6, to get 67 people. The previous posts in this series explained all of the party capacities for people. The last post will deal with miscellaneous measurements. In the third installment of Tent Seating guidelines, we will show the seating capacity for Served Dining in a tent. And now even more funky math: for Served Dining, which usually uses 60″ round tables that seat between 8 and 10 people, you need to allow for 8-10 square feet per person, for appropriate comfort. This number also factors in the size of the table. 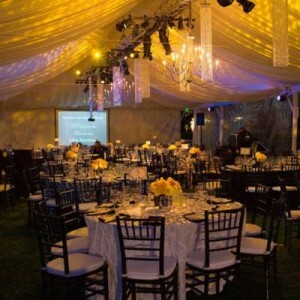 A 20 x 20 foot tent covers 400 square feet, so 400 square feet divided by 8 square feet equals 50 people. This is the recommended maximum. 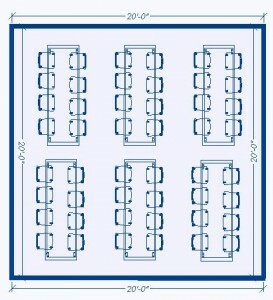 If you wanted to make sure people were spaced further apart and more comfortable which we strongly recommend and is shown above, divide 400 by 10, to get 40 people. 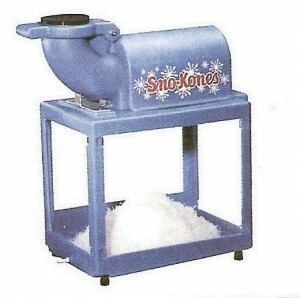 The previous posts in this series explained cocktail party capacity and buffet dining capacity. Follow up posts will feature cathedral/auditorium seating, and miscellaneous measurements. 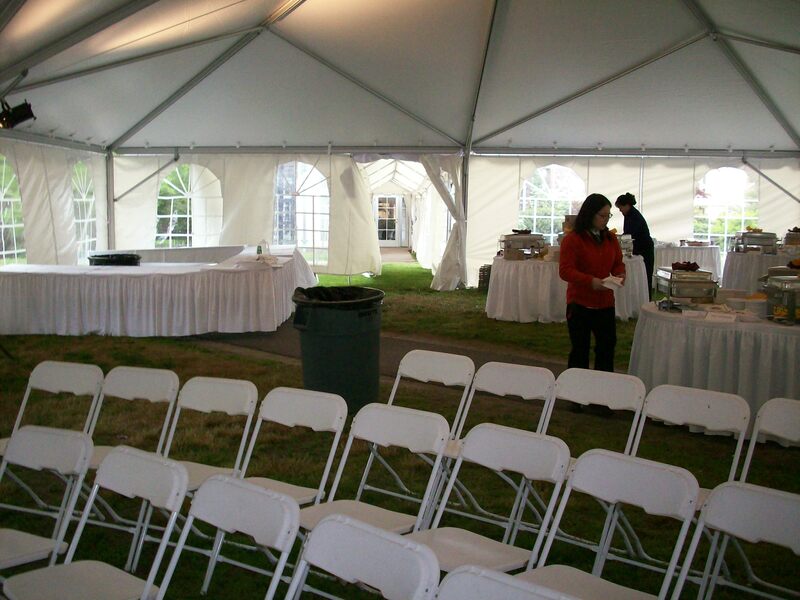 In this second installment of Tent Seating guidelines, we will show the seating capacity for Buffet Dining in a tent. And heeeeeerrrrrre’s the funky math: for Buffet Dining, which usually uses 8′ long tables that seat between 8 and 10 people, you need to allow for 7-8 square feet per person, for appropriate comfort. This number also factors in the size of the table. A 20 x 20 foot tent covers 400 square feet, so 400 square feet divided by 7 square feet equals 58 people. This is the recommended maximum. If you wanted to make sure people were spaced further apart and more comfortable which we strongly recommend and is shown above, divide 400 by 8, to get 50 people. 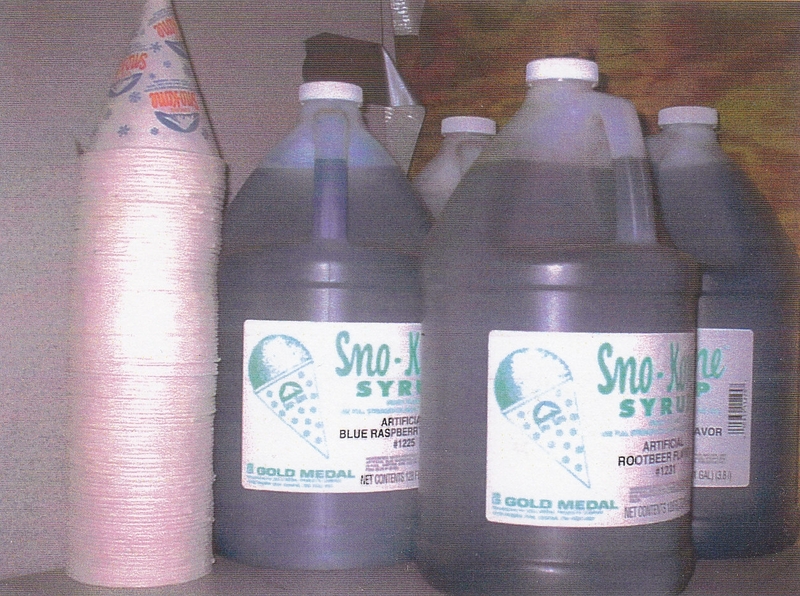 The previous post in this series explained cocktail party capacity. Follow up posts will feature serviced seating, cathedral/auditorium seating, and miscellaneous measurements, respectively. 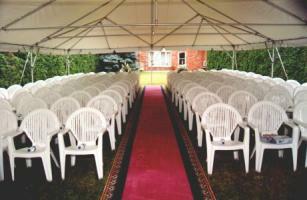 Previously, we posted a blog that tried to give recommendations on tent seating. 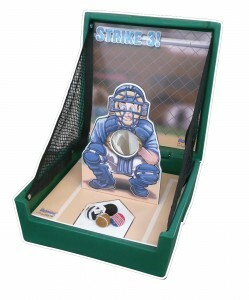 Looking back on that now, it was very rushed and, we believe, unsatisfactory for the needs of our clients. Therefore, for the next few weeks, we will be posting and explaining the true dimensions of tent space and seating ability for your events. And yes, we will be doing more funky math again. The math behind this is fairly simple. For a Cocktail party, with 30″ across cocktail-height tables and people standing, not sitting, you need to allow for 6-7 square feet per person, for appropriate comfort. This number also factors in the size of the table. 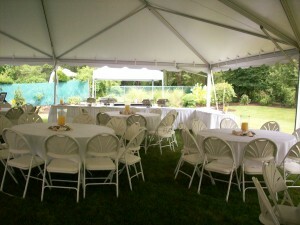 A 20 x 20 foot tent covers 400 square feet, so 400 square feet divided by 6 square feet equals 67 people. This is the recommended maximum. If you wanted to make sure people were spaced further apart and more comfortable, divide 400 by 7, to get 58 people. Follow-up posts in this series will explain buffet seating, serviced seating, cathedral/auditorium seating, and miscellaneous measurements, respectively. We are just posting this as a reminder to our customers. The graduation season is fast approaching, and just as your little students are having their big day and stepping further into adulthood, so too is everybody else’s child. The weekends of May 17th through until June 3rd, our stock of equipment runs low. If you need to plan a party for graduation season, now is the time to start making the plans and reserving your equipment.